For those who wanted to see Sofia Coppola’s “Somewhere” because of Stephen Dorff but were weary of its polarizing, artsy DNA, here is the “Chronicle” or “Hancock” version of that film with one key difference. Coppola’s project worked with Dorff’s scruffy charisma by presenting the former Hollywood fixture as someone coming down to anonymous Los Angeles from the egotistical heights of stardom. Writer/director Nick Love’s “American Hero” barely gets a hundredth of that mileage by treating Dorff as a plain underdog, nonetheless as someone who decides 40 minutes into the movie to use his busking magic trick telekinesis for good. There’s always a compelling outsider quality to Dorff, a student of the unapologetic, always slightly-meta presence (of which Nicolas Cage is the master). “American Hero” is an obnoxious rock star moment, with images of Americana that have apparently been lost in translation by an outsider British director. Dorff plays Melvin, a New Orleans slacker and deadbeat dad who spends a lot of his time drinking, partying—basically doing nothing. But, in this world, he is our hero, trying to pull himself together so that he can see his estranged son Rex again after his ex-wife had the court give her full custody. Assisted by his wheelchair-bound friend Lucille (Eddie Griffin, playing a sassy, sharp-tongued buddy seemingly conceived to fulfill stereotypes), Melvin tries to get clean, but despite the good vibes of NOLA sunsets or running up and down the aisles of a gospel church, eventually boomerangs back. Oh, and Melvin can control things with his mind, as he does in a mask sporadically for street audiences (with the hyping help of his buddy Lyle, played by Luis Da Silva Jr.) and sometimes to take money from imbecilic convenience store crooks and the like. After partying too hard (AKA a cardiac arrest) nearly kills him halfway into “American Hero,” Melvin elects to perhaps use his abilities to help the community, which is directly being harmed by drug dealers peddling to kids. A Dorff sideshow first and foremost, "American Hero" is far too casual with Melvin’s character arc, and the appeal of superhuman abilities. Love doesn’t just downplay them by a casual reveal, but makes it more of a shallow afterthought—the pacing killing the chance of even light amusement—or a means for sporadic visuals of Dorff moving his hands, and throwing a car door 100 yards. 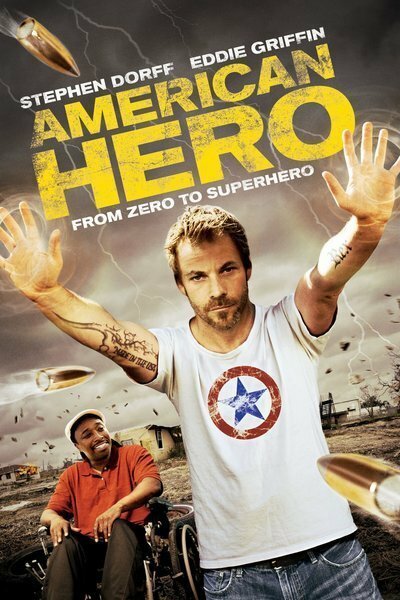 “American Hero” doesn’t have a large thematic scope to envelop its jarring shifts from his super partying to super self-pitying, making punchline-less jokes out of Dorff doing Dorff things. In one scene, he raves about a Tchaikovsky concerto by clamoring about “The changes! The notes! The way it crescendos!” In another, he reads a passage from Guy de Maupassant and then says to the heavens, “I dig you, man!” What does this movie even think of Melvin? Needless to say, "American Hero" is often at odds with self-awareness. The whole proceedings are recorded by, of course, a documentary crew that’s used narratively with the same inconsistency as any uninspired single-camera, found footage movie. With the “crew” grabbing some pleasant wide shots of the New Orleans skyline amongst its action, some extended sequences (Melvin’s final showdown, a telekinetic free-for-all in one take) also play out with relatively seamless visual effects—regardless of the similar shenanigans of “Chronicle” that came three years and 800 superhero movies ago. But even in such focused moments of action, a different logic falls out: what documentary crew would so casually follow Melvin into these life-or-death scuffles, especially when gang members are trying to spray everyone with bullets? With little force behind its heroes or its villains, watching “American Hero” most of all makes a viewer increasingly concerned for what safety standards a director doesn’t set for their crew, on and off-screen. To call writer/director Nick Love a total outsider to his subjects and setting wouldn’t be much of an exaggeration. In the film’s press notes, the British director answers as to why he shot in New Orleans with the sentimental answer of “for the tax breaks,” reasoning after that he did eventually fall for the place (possibly in part for the tax breaks?) By little coincidence, his movie essentially wears America Face as it “documents” a post-Katrina New Orleans, presenting it as a racial melting pot with cringing racial stereotypes and ideas of gender, centered around a generic idea of the new cowboy. The movie wants to be not just American, but All-American. Proving its title to have no wink behind it, “American Hero” does us (or the U.S.) very few favors.